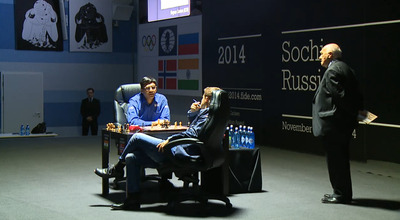 On Wednesday at the World Chess Championship in Sochi, Russia, Game 4 ended in a draw. Sure, I realise that sounds like a downer, after a Game 2 in which Magnus Carlsen, the world number one and current World Champion, crushed his Challenger, Vishy Anand. And a Game 3 in which Anand, who is from India, struck back and crushed Carlsen, a Norwegian. You couldn’t have asked for two more exciting days of great, fighting chess between two elite players. Prior to the match, plenty of experts and observers thought that although Anand has done well to get back to the WCC to stage a rematch of last year’s contest, which he lost, he didn’t stand much of a chance against Carlsen, currently the highest rated player in the history of the game. Anand has completely reversed that opinion and proved not just that he remains a tremendous player at the top level, but that he’s a worthy challenger for Magnus’ crown. Game 4 may have lacked some of the drama of Games 3 and 4, but it was still thoroughly impressive, for similar yet different reasons. The score now stands at 2 points apiece, with 8 games to go (draws are worth half a point, wins a full point, and losses zero). Even though the game ended in a draw, it started with a bang. I’ve been arguing that Anand, at 44, needs to take it to his younger opponent with both the white and black pieces. 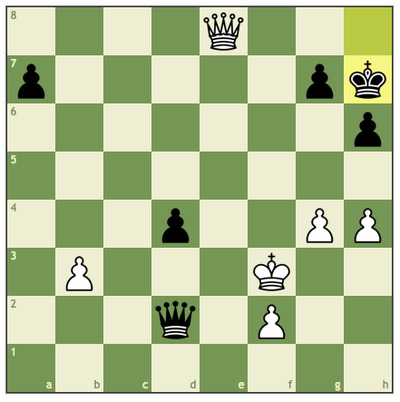 In chess matches such as this, players alternate black and white, although because playing white is an advantage statistically, in a 12-game match, the payer who begins with black will often get two games in a row with white to even out the odds. Last year, the match between Anand, then the World Champion, and Carlsen, the challenger, started with four draws. Then Magnus gained the upper hand and finished Anand off in 10 games. No one wanted to see that happen again, and the players have obliged. Game 1 was a true fighting draw; Game 2 was a bold refutation by Carlsen of one of the premier Grandmaster-level defenses, the Berlin Defence; and Game 3 was a wildly complex theoretical struggle engineered by Anand that left Carlsen dazed and bewildered. With the black pieces again after a decisive win, Anand stated his intentions right away. Carlsen played the opening move 1. e4, moving the pawn in front of his white king two spaces forward. 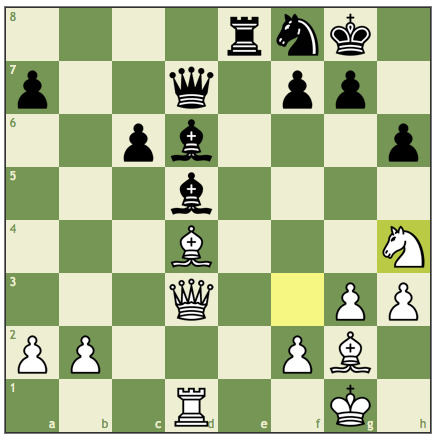 The last time Anand played black, he went for the Berlin Defence, an opening that has become a much-studied drawing weapon among GMs. You can read my recap of Game 2 for a primer on how the Berlin develops and why. This time, he did what everyone hoped he would do: he played 1…c5, pushing his pawn on the c file forward two squares. Chess.comBlack’s move c5 after white’s e4 sets up the legendary Sicilian Defence. This is the most aggressive reply black has to 1. e4. It’s called the “Sicilian Defence,” and it has preoccupied the minds of the world’s greatest chess players for centuries. I’ve already delved into the Sicilian — the preferred opening, I should add, of my 9-year-old chess-playing son, but a completely intimidating and difficult opening for me — in previous recaps. So check those out if you want to quick rundown on what the opening is all about. The chess cognoscenti observing the match could scarcely contain their glee when Anand played c5. Sopiko Guramishvili, a female Grandmaster commenting alongside GM Peter Svidler for the official online broadcast, was so delighted that her voice rose half an octave when the move was on the board. But that’s the Sicilian for you. It shows that the black player isn’t aiming for a draw — he’s playing to win. For Anand, the statement was clear: I’ve won once, and now I plan to win again. This was the Comeback Kid…er, Middle-Aged Man?…story everyone watching had hoped for: Anand recognising his late-career chance and holding nothing back. A neat thing about the Sicilian is that in its many, many variations, it tends to create positions on every move that are deeply intriguing. Because the earliest position is visually unbalanced — the e-pawn and and c-pawn look like they’re floating in space, and the game itself looks more like two separate games that could at some point converge violently — that theme persists, regardless of how either side labors to calm things down. Nevertheless, Carlsen swiftly tried to diffuse the potential for dynamic, tactical play — an Anand speciality — and went for a “quiet” Sicilian line of play. If there even is such a thing. I’ll show two positions here that illustrate what I’m talking about. 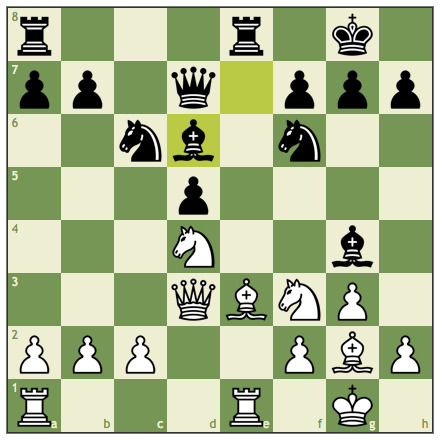 First, the attacking setup that Anand developed before move 20. As you can see, both of black’s bishops and his queen are aiming for the white king, with threats of checkmate coming via the g- and h-files. Chess.comThat’s a lot of attackers aiming at white’s king! Magnus, as white, is supposed to be the aggressor, but as you can see, most of his pieces are forming a defensive barricade around his castled king, waiting for the black assault so that a counterattack can be launched. Black could miscalculate and overextend, and that’s what white is hoping for — so that he can then switch from defence to attack and storm the black king on the same side of board. That’s a huge battle brewing on the jam-packed d-file and the adjacent e-file! 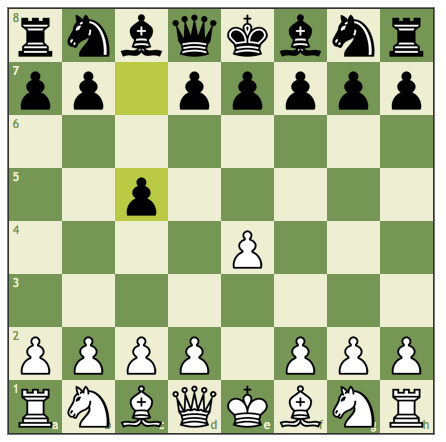 Positions like this mean that either some kind of attack coming, or that black and white are going to enter a melee in which a lot of pieces come off the board very rapidly. When black plays the Sicilian, this is the idea. To provoke conflict and chaos and ultimately, to win. Best outcome for Anand: win. Worst: draw. But he’s found his edge, and it’s called the database-that-is-my-brain. My daughter thinks Anand looks like Mr. Spock from “Star Trek.” She’s spot-on: Anand is sort of playing three-dimensional chess against Carlsen now: one dimension on the board, one in the mind, and one in the body. For the last of those, Anand understands that he has to go for wins to have a chance at getting back the title before his age catches up with him. It might not have looked like power chess, but it was. Anand established a strong position, but Carslen knows the Sicilian and all its variations well enough to diffuse the threats. Matters got tricky as the players headed for the first time control, after two hours of play. Magnus had to blitz out a few moves. But by then there were only kings, queens, and pawns on the board. So he was able to avoid losing on time. Chess.comSetting up for a queen endgame. Queen endgames are very difficult. The most powerful piece on the board can cover so many squares that it’s extremely challenging to “activate” the king in any meaningful way or get a pawn to your opponent’s back rank and put an extra queen on the board. With proper play, one side can usually manoeuvre into a position where an endless, “perpetual” check occurs. That’s what happened by move 47 of Game 3. 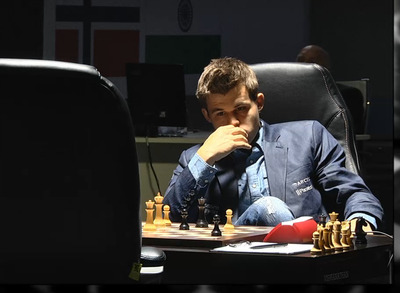 Carlsen had the perpetual, and after two consecutive checks, the gentlemen called it a draw. And gentlemen they were! One of the great images in modern sports then appeared. Anand and Carlsen spent an additional few minutes discussing the position and the game. They knew that they had produced something simultaneously beautiful and yet frustrating. 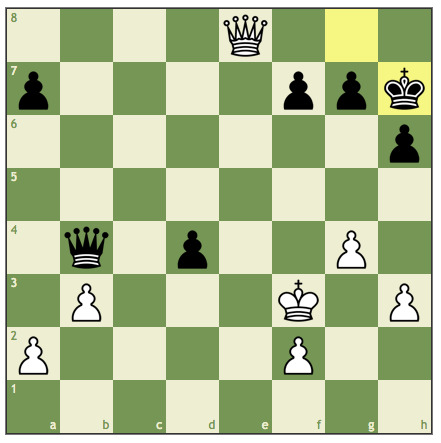 It was sort of Carlsen’s fault, for avoiding the sharper Sicilian lines and aiming for a more low-key game. But he still had to play it out. The two men clearly have great respect for each other. After 4 games — as Carlsen pointed out — the score is exactly the same as last year: 2-2. But how we got here! Whew! For chess fans and even newcomers to the game, it’s been an utter thrilling start to the World Chess Championship rematch. Thursday is a rest day. The match will resume on Friday, with Anand playing white. You can watch the entire match replay here. And GM Daniel King provides a great review of the game at ChessBase.